Pickwick, Texas submerged ghost town. Although the area was first settled in the mid 1850s, the Civil War and Indian attacks delayed the establishment of a town. The name on the post office application was originally Westerville, but residents were notified that another town had already taken the name for their post office. One resident who had been enjoying Dickens's The Pickwick Papers, suggested the name Pickwick and this was the name submitted on the new application. The name was granted by the postal authorities and breaking slightly with the tradition of first post offices being in stores, Pickwick's first post office was set up in the town's blacksmith shop. Silas Wester, who was to have been the town's namesake became the town's first postmaster. The post office was opened in 1903 and remained open through WWII. Dispite the addition of a cotton gin, store, school, church, and sawmill, Pickwick remained small. In 1919 the town's doctor moved, and the town lost several of its businesses. 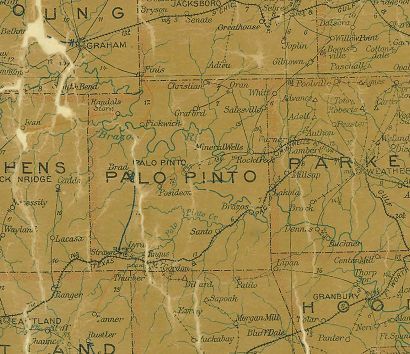 The town was purchased in 1939 for the proposed Possum Kingdom Reservoir. But even though the land might have been sold - Pickwick didn't have to die - the post office and the store it operated from were moved two miles east of the former site. Likewise, the Pickwick school was moved. "New Pickwick" didn't take. The school operated under another name LuKingdom (for some unexplained reason) and by 1946 the store and post office closed. Pickwick still managed to report a population of thirty in the late 1960s. In times of drought, the old Pickwick iron bridge is said to be visible.